A lush valley between volcanic hills near the Viki crater in spectacular countryside near Myvatn Lake in northern Iceland. What a beautiful location! And what an amazing place for restoration and renewal of body and soul. This photo was made near the top of the Stora-Viti crater near the town of Myvatn in northern Iceland. You'll notice how the warm light washing over the foreground is balanced by the cool blue light from an approaching storm front. I love how contrasting colors add that extra dynamic to a photograph. It's the kind of landscape that calls out to the wanderer in us all. Wouldn't you like to walk into this scene; to lose yourself, at least temporarily, from the worries of the world. It's my belief that immersion in the landscape can bring relief for a weary heart, release for a troubled soul and restoration to an overly stressed mind. It's the perfect place for reflection and renewal. In addition to the warm/cool color palette I was drawn by the shapes and textures of the landforms and the dramatic light which seems, somehow, to breathe life into the Icelandic landscape. 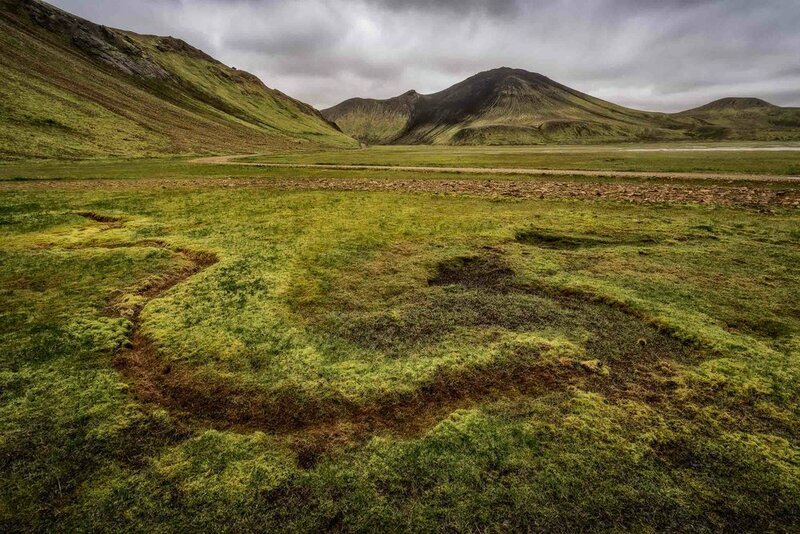 Lush, boggy moss, photographed under eerie light, in a large valley in the Highlands region of Iceland. I've had the good fortune to travel to Iceland on two occasions. I'm very much looking forward to my next trip when I plan to spend considerably more time immersed in the poetic beauty of that country's epic landscapes. Whether it be mountain or sea, ice or beach the landscapes of Iceland are epic. The weather, at any time of year, can be fickle. It rains quite a lot in Iceland, but the most glorious light can occur either side of an approaching weather front. I’d go as far to say that it's the transforming and transcendental nature of light that, just as much as the landscapes themselves, is what you'll find most compelling about this incredibly beautiful island nation. 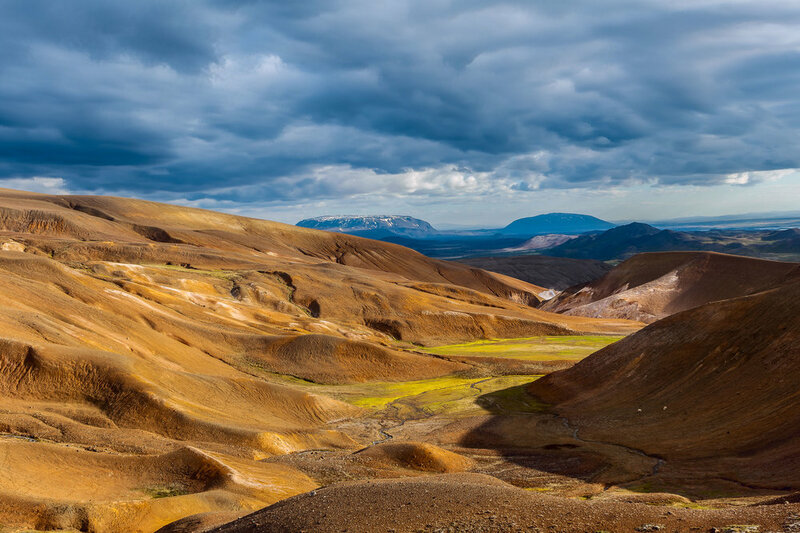 If you’re weary, in body and in mind, Iceland may be just what the doctor ordered. While an interesting city, my advice is to get out of Reykjavik as soon as you can. It’s in the landscape that you’ll find the restoration and renewal your heart desires.